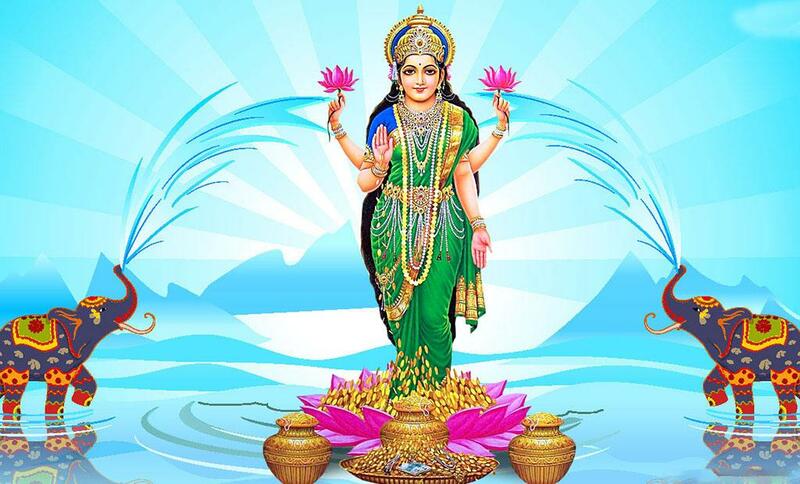 Lakshmi ( लक्ष्मी ) or Laxmi, is the Hindu goddess of wealth, fortune and prosperity. She is the wife and shakti (energy) of Vishnu, one of the principal deities of Hinduism and the Supreme Being in the Vaishnavism Tradition. Lakshmi is also an important deity in Jainism and found in Jain temples. Lakshmi has also been a goddess of abundance and fortune for Buddhists, and was represented on the oldest surviving stupas and cave temples of Buddhism. In Buddhist sects of Tibet, Nepal and southeast Asia, goddess Vasudhara mirrors the characteristics and attributes of the Hindu goddess Lakshmi with minor iconographic differences. Lakshmi is also called Sri or Thirumagal because she is endowed with six auspicious and divine qualities, or gunas, and is the divine strength of Vishnu. In Hindu religion, she was born from the churning of the primordial ocean (Samudra manthan) and she chose Vishnu as her eternal consort. When Vishnu descended on the Earth as the avatars Rama and Krishna, Lakshmi descended as his respec- tive consort.In the ancient scriptures of India, all women are declared to be embodiments of Lakshmi. The marriage and relationship between Lakshmi and Vishnu as wife and husband is the paradigm for rituals and ceremonies for the bride and groom in Hindu weddings. Lakshmi is considered another aspect of the same supreme goddess principle in the Shaktism tradition of Hinduism. Lakshmi or Mahalaxmi ( Mahalakshmi ) is the Hindu Goddess of wealth, fortune, love and beauty, the lotus flower and fertility. Representations of Lakshmi (or Shri) are found in Jain and Buddhist monuments, in addition to Hindu temples. Generally thought of as the personification of material fortune and prosperity, she is somewhat analogous to the Greco -Roman Aphrodite or Venus, as she also represents eroticism and is similarly thought to have originally "borne of the sea" in her most famous myth, as did those love goddesses. She is the consort of Vishnu and married his incarnations Rama (in her incarnation as Sita), Krishna (as Rukmini) and Venkateshwara (as Alamelu). In addition to Rukmini, however, she was also thought to have incarnated as the milkmaid Radha, Krishna's youthful lover prior to his marriage to Rukmini. In Vaishnava traditions, She is believed to be the Mother Goddess and the Shakti of Narayan. Goddess Laksmi is the deity of wealth, affluence an ruling power. In astrology Venus represents Lakshmi, Durga, Santoshi Ma and Shiva-Parvati. Venus rules over Taurus and Libra signs. Venus in odd signs represents Lord Shiva. Venus in even signs represents Lakshmi, Annapurna Parvati, Vaishnavi Durga, Santoshi Ma etc. When Venus owns Lagna, 5th, 9th and 10th house and when Venus occupies Lagna, 5th, 9th, 10th and 12th house worship of Laxmi may give immense prosperity. The appearance of goddess Lakshmi is related to an ancient story. Durvasa the short-tempered sage once presented Indra, the king of the gods (devas) with a garland of flowers which would never wilt. Indra gave this garland to his elephant Airavata. Sage Durvasa saw the elephant trampling the divine garland and cursed Indra, for he had shown disrespect to the sage. The sage cursed Indra that he and all the gods would lose their power because it had made them so proud and vain. Due to the curse, the demons vanquished the gods out of the heavens. The defeated gods then went to seek refuge to the Creator Lord Brahma who asked them to churn the ocean of milk, Ksheersagar, to obtain the nectar of immortality. The gods then went to Lord Vishnu, to seek his assistance. Lord Vishnu took the Avatar Kurma (Tortoise) and supported the Manthara Parvata (mountain) as a churning rod, while the king of the serpents, Vasuki, became the churning rope. The gods and the demons (under the leadership of the pious and wise King Bali Chakravarti) both helped each other in churning the ocean of milk. Amongst the host of divine gifts which appeared from the ocean, goddess Lakshmi appeared and then chose Shri Vishnu as her consort, as only He had the power to control Maya (illusion). since the moon also appeared from the ocean during the churning, the moon is called her brother. Alakshmi, the goddess of misfortune, is Lakshmi's older sister. She is said to have also arisen from the sea of milk. According to the Vishnu Purana, Lakshmi is the daughter of Bhrigu and Khyaati and resided in Swarga but due to the curse of Durvasa, she left Swarga and made Ksheersagara her home. The reappearance of Lakshmi after Samudra manthan and her marriage to Vishnu thereafter, remain the same. Laxmi is the power and Maya of Lord Vishnu. In some places She is seen in two forms, Bhudevi and Sridevi, both either side of Vishnu. Bhudevi is the fertility form in which She is Mother Earth. Sridevi is the wealth and knowledge of Her which is seen with Narayan. Most people are mistaken that they are separate beings although they are one, Laxmi.